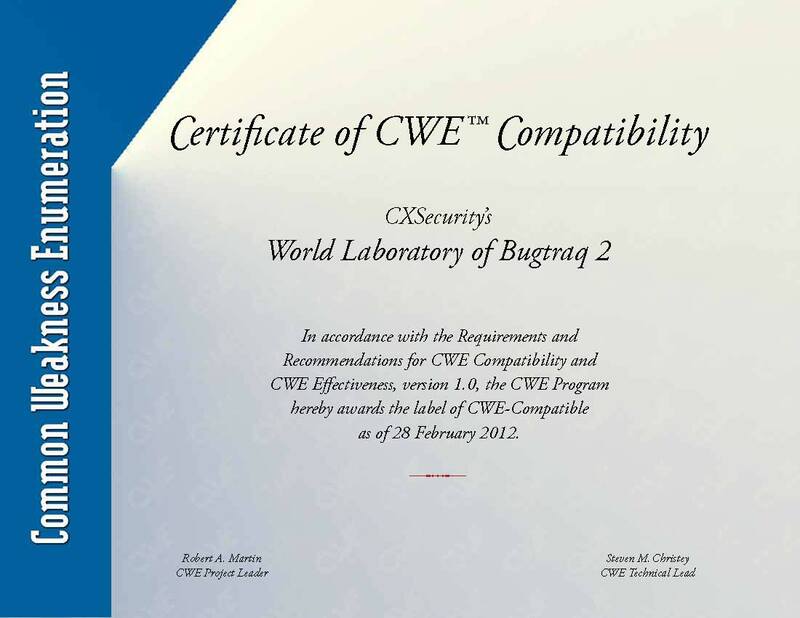 (WLB2) World Laboratory of Bugtraq is a huge collection of information on data communications safety. Its main objective is to inform about errors in various applications. The WLB tolerance does not exclude information on errors in a configuration or other entries of this kind of dangerous operations character. One of the basic foundations of "World Laboratory of Bugtraq" is interaction with users. Each safety note, can be reported, and then verified by the CXSecurity. The second version of the database WLB2, introduces many changes from the previous version WLB1, acting on pages securityreason.com. 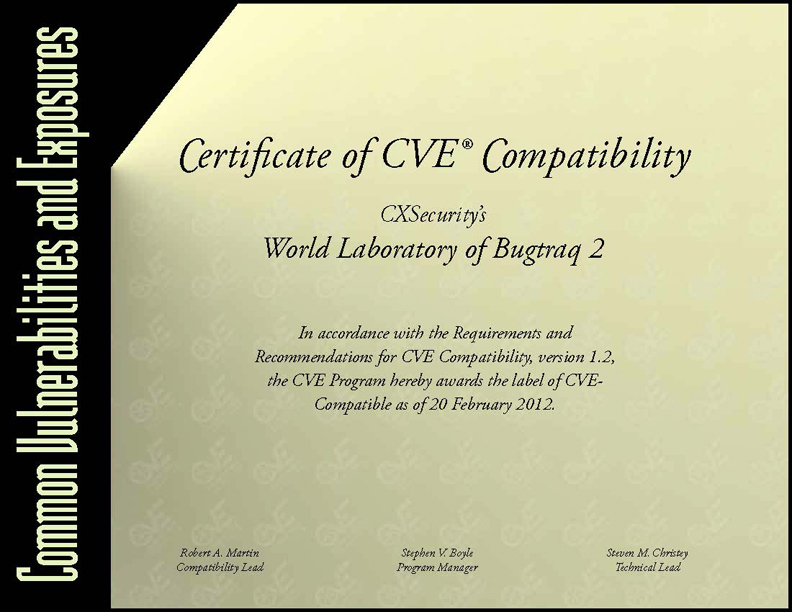 Adding value for CVE CWE CVSS-defined entries in the database or add a new status of 'exploit' is not the only innovations in the next version of World Laboratory of Bugtraq (WLB2). We wish you a good time. CXSECURITY Team == One person! Let our enemy will be your enemy. Peace and respect for all. which proves that a given entry was added to the base in November, 2000. The last numbers denote the ID number the given vulnerability in the given year and month. A WLB list has no limitations concerning information on data communications safety. Everyone is allowed to send a proposal of a note to the list. Just use this form or email submit@cxsecurity.com Safety notes can be added automatically by moderators. Topic defines the topic of an vulnerability, containing general information about the software and the kind of an error. Date defines the year, the month, the day. The aim of this value is to inform the user when a given entry was officially made accessible. It is analogical with the Updated field, with a small difference referring to the last accepted change in a given note. Credit defines the person who is the author of the given vulnerability as presented and described in the WLB safety note. Risk is a variable defining the total threat which can result from a given item of information. The criterion marking one of three levels, it is possible to use that information as well as the number of machines with the defective code. Remote/Local define the manner of the vulnerability utilization as each machine can be attacked form the outside or from the internal level. These are quite important parameters since they tell us about the tactical utilization of the given information. History defines which changes were made into a given note, by whom and when. The dates define the time when that happened. References is a field containing references to further information on a given vulnerability. One is permitted to enter references leading to the authors' web sites. Bug this informs that a note refers to the vulnerability present in a given application. Each item of information with this status states that a given vulnerability has taken place or is taking place at present. Bogus each item of information with this status has a task to negate the existence of the false information. The use of this status is permitted in the case of a mistake or in order to countercheck the expansion of unnecessary panic. Trick all information with this status are of the character which proves a lack of cohesion among programmers, a possibility of an attack because of a bad configuration, a presentation of a new aspect of avoiding protections or (unnecessary) philosophical disputes on the theory of machine safety. Exploits this informs that a note refers to the exploit or PoC (Proof of Concept) present in a given application. CVE are unique, common identifiers for publicly known information security vulnerabilities. CWE is a formal list of software weakness types created to serve as a common language for describing software security weaknesses in architecture, design, or code. The CVE ID of a vulnerability, if available, is displayed in the "Details" tab of the WLB2 Database. - Serve as a common language for describing software security weaknesses in architecture, design, or code. - Provide a common baseline standard for weakness identification, mitigation, and prevention efforts.